Notes: Torksey Castle is a manor house located in the centre of the village of Torksey on the east bank of the River Trent in Lincolnshire, England. It is 12 miles northwest of Lincoln on the A156 road. Seven miles to the north is Gainsborough Old Hall and 10 miles southeast is Lincoln Castle. It is a 16th-century Tudor stone-built fortified manor house founded by the Jermyn family of Suffolk. The building is on the Buildings at Risk Register. The site is strictly private, with no public access and is only visible from the A156 road and a public footpath, on the west bank of the River Trent. 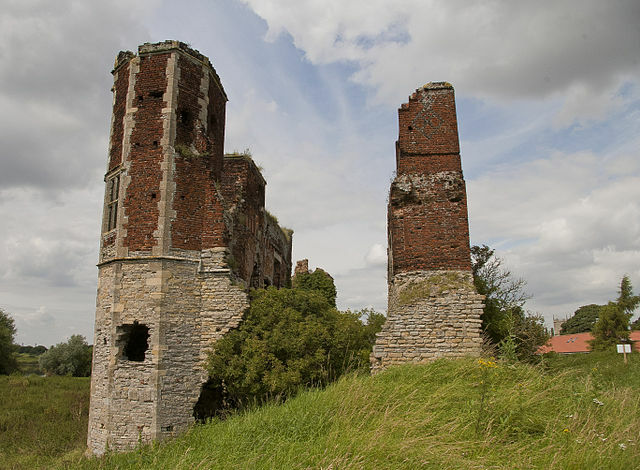 Torksey Castle at Heritage Trust of Lincolnshire.